In the rush to bring new technology to every industry, software developers are always looking for that "next big idea." When the public outcry against plastic water bottles got louder, one developer decided it was time to go back to basics: public drinking fountains. For centuries it was not uncommon to stop at a drinking fountain to quench one's thirst but just like pay phones, they have gone by the wayside. But one developer wants to bring them back. Instead of heading to the corner store for a water bottle while running from place to place, the free WeTap app for Android is using the world's largest database of drinking water sources to direct people to more eco-friendly water sources. The initiative, spearheaded by Pacific Institute, is aiming to bring this most basic source of water back into the mainstream. By directing users to drinking fountains through crowd-sourcing, more attention will be paid to broken fountains. According to Dr. Peter Gleick of the Pacific Institute, who also wrote "Bottled and Sold: The Story behind Our Obsession with Bottled Water," one of the reasons for the explosive growth in bottled water was the rapid disappearance of public drinking fountains." But that's the beauty of WeTap. Users can quickly add or modify information about drinking fountains from their smartphones and rate the condition, water quality and other data, as well as adding a photo or comment. Did you ever wonder how people found an adequate supply of drinking water before we had water treatment plants? It is doubtful they had this contraption, but very possible they relied heavily on drinking water. A new novelty raincoat called "Raincatch" is the ideal way to take advantage of heavy rainfall in a brand new way. With this raincoat, rain water is collected in the collar and it runs through a network of tubes, where it is filtered by charcoal and chemically purified. Then the purified drinking water is stored in containers on the hips where it can be sucked out through another tube. More symbolic than practical, this raincoat is a product of the Copenhagen Institute of Interaction Design, and has been featured in Wired ("Coat Captures Rain, Turns It into Drinking Water.") While it is doubtful that an adequate supply of drinking water could not be found in a country wet enough to warrant a raincoat it is an ideal invention for cyclists, who could wear it as both a rain cape and water filter. 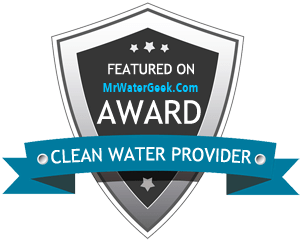 Another water-related "smartphone app-inspired" gadget was recently featured in the "Gear and Gadgets" section of Discovery.com. The Tyent UCE 9000 is a "Turbo Water Ionizer" that lets smartphone users "supercharge" their water. With just a touch of the LCD screen it is possible to output the perfect pH level water directly from your faucet. The UCE 9000 can make antioxidant-rich, highly oxygenated alkaline water, which is ideal for cooking. This supercharged water also helps improve hydration levels and has more antioxidants than a glass of orange juice. This gadget features a .01 micron ultra-double filtration system, which utilizes both a ceramic and carbon filter. Unlike reverse-osmosis water, this filter removes unwanted minerals while leaving in the good ones. Made by Tyent USA is priced at $2,995. Of course if you are not technologically savvy and you just want a convenient source of purified drinking water, it may be easier to purchase pre-purified water in large refillable containers. The concept of supplying water in this form has caught on in virtually every office, yet families are just starting to embrace it. Not only does it encourage more water drinking among family members, it is also environmentally friendly and cost-effective.